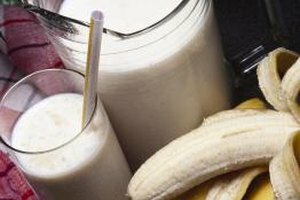 Protein powder can be part of a banana-coconut smoothie. 4 What Can I Eat for Breakfast That's High in Protein & Low in Carbs? At breakfast, force of habit may have you reaching for yet another white-flour bagel or muffin and forgoing your morning protein. Put the healthy back in breakfast with easy high-protein recipes that help keep you and your family feeling satisfied throughout the morning. Scrambled egg whites or tofu are easy high-protein options ideal for breakfast wraps. Pour two egg whites or crumble a handful of drained tofu into a nonstick pan sprayed with olive oil cooking spray. Scramble eggs or tofu over medium heat for three to five minutes, adding cheese, chopped vegetables or nutritional yeast for an extra nutrient boost. Sprinkle with black or red pepper, ranch-flavored dry mix, or add a dash of hot sauce. Spoon eggs or tofu into a spinach tortilla for breakfast on the go. Quinoa is a high-protein seed that can be cooked as a grain and served like a hot cereal. Prepare quinoa just as you would prepare oatmeal or any other hot cereal. Add sliced fruit, frozen berries, a handful of chopped walnuts and a spoonful of raw honey or maple syrup. Smoothies and fresh fruit juices become nutritional powerhouses when you add a scoop of protein powder. Try blending vanilla soymilk with banana, chopped pineapple, shredded coconut and a scoop of whey or soy protein powder for breakfast in a glass. If you don't have protein powder, add a spoonful of organic nut butter. Blending smoothies in a blender with ice ensures that the protein powder mixes in fully and the smoothie tastes refreshing and not chalky. Protein powder has a taste that doesn't appeal to some kids, so you might need to adjust your smoothie recipe. For a kid-friendly smoothie, combine yogurt, strawberries, bananas and ice. Or omit the strawberries and add a bit of peanut butter. Add low-fat cheese to your breakfast for a serving of healthy protein. Have a piece of string cheese with fruit, spread cream cheese seasoned with ranch-flavored dry mix on a whole-grain bagel or melt shredded cheddar over your scrambled eggs. Grilled cheese sandwiches made with olive oil cooking spray and multigrain bread are a healthy, high-protein option for those who don't care for breakfast foods. Another option is a slice of leftover veggie pizza; make your own by topping an English muffin with marinara sauce or creamy dressing and part-skim mozzarella and baking it in a toaster oven. Add some meat to the pizza to increase the protein.